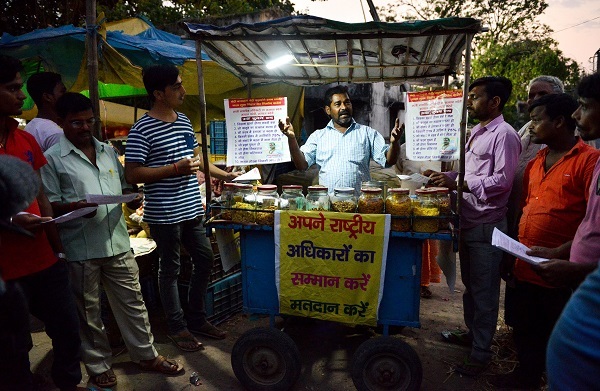 Indian bicycle-snack-hawker, Lal Mani Das, speaks to his customers and prospective voters to raise awareness on the country's election at a vegetable market in Patna (Photo: NARINDER NANU/AFP/Getty Images). LAL MANI DAS raises his voice above the morning din outside a railway station in the eastern Indian city of Patna city to make an appeal: ‘Vote for a strong democracy’. 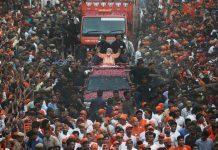 The 45-year-old from impoverished Bihar state is not a vote-seeking politician or a government election agent in the world’s biggest election that began on Thursday (11). Instead he is an ordinary snack-hawker with a bicycle on a mission to exhort people to vote and with their heads during the almost six-week polling period lasting until May 19. “I felt a strong urge to do something about how people waste their votes by either electing wrong candidates or not voting at all,” Das said as he cycled along a chaotic road with banners festooning his bike and body. The champion for democracy juggles between his evening job of selling traditional snacks and his “Cycle Jagrukta Yatra” (‘Cycle Awareness Journey’) mission. Das said he spent Rs 10,000 out of his own pocket that he had earmarked for his four children’s education to print thousands of flyers with his vision of India. This includes the sometimes opaque selection process for candidates to parties bribing voters with cash, liquor and other freebies or resorting to violence. For this he has drafted a checklist which he wears of 10 points to look out for in a candidate, including their criminal past, honesty and spending habits. 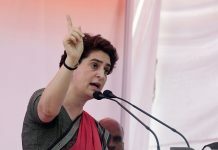 If candidates do not pass muster then he has a suggestion: Vote ‘NOTA’ – none of the above something that six million people did at the 2014 election, or 1.1 per cent of votes cast. Das said it also pains him to see politicians fight inside parliament the “temple of democracy,” he calls it instead of tackling matters of public concern.